Dr. N. Anandan did his undergraduate medical education at Stanley Medical College, University of Madras and obtained his MBBS degree from University of Madras. He completed MS in General Surgery with distinction and gold medal from the University of Madras. He did his higher surgical training in surgery and Urology over a period of seven years in the United Kingdom. Dr. Anandan attained his FRCS from the Royal College of Surgeons of Edindurgh in 1981 and higher surgical Postgraduate Diploma in Urology from the University of London in 1985. After returning from the United Kingdom, he worked as Assistant Professor of Urology at Sri Ramachandra Medical College, Chennai. Subsequently, Dr Anandan held the position of a consultant urologist at Teaching hospitals in the Kingdom of Saudi Arabia. 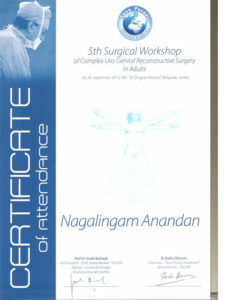 After returning from Saudi Arabia, he continued his Urological and Andrological practice in Chennai. 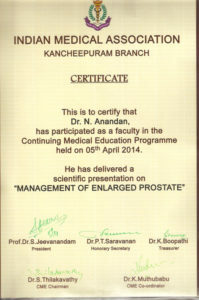 Dr Anandan has vast experience in Penile Implant Surgery & Penile Curvature Correction surgery. 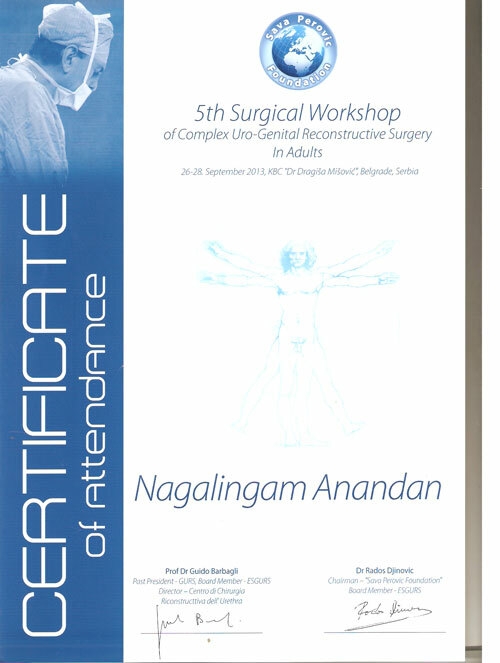 Dr Anandan has been an active participant in several national and international meetings on Urology and Andrology. He is a life member of the various societies and associations including Urological Society of India (USI), Associations of Surgeons of India (ASI), Society International d’Urologie(SIU) and International Society of Sexual Medicine(ISSM). Quite recently, he participated in the 6th International surgical workshop on Reconstructive Urology held in Hamburg, Germany on March 2013.